Colombo, December 4: Indian agriculture is in dire straits. The terms of trade with the other sectors of the economy have been worsening over the years. State investment in agriculture has also been declining compared to investment in industry and other sectors. Formal credit has been yielding place to the more expensive private sector credit. All this has led to a widespread and unsustainable indebtedness and an alarming increase in farmer suicide. In November, agitated farmers took out massive marches in New Delhi, Mumbai and Kolkata. Lakhs of them converged on these centers of power to demand higher Minimum Support Prices (MSP), loan waivers, and a special 21 day parliament session exclusively devoted to their problems. India is an agrarian economy with around 60% of its population depending directly or indirectly on agriculture. The Indian agricultural sector accounts for 18% of India’s GDP. And yet, farmer suicides account for 11.2% of all suicides in India. The IndiaSpend website reported that in the ten year period ending in 2016, more than 142,000 farmers had committed suicide. 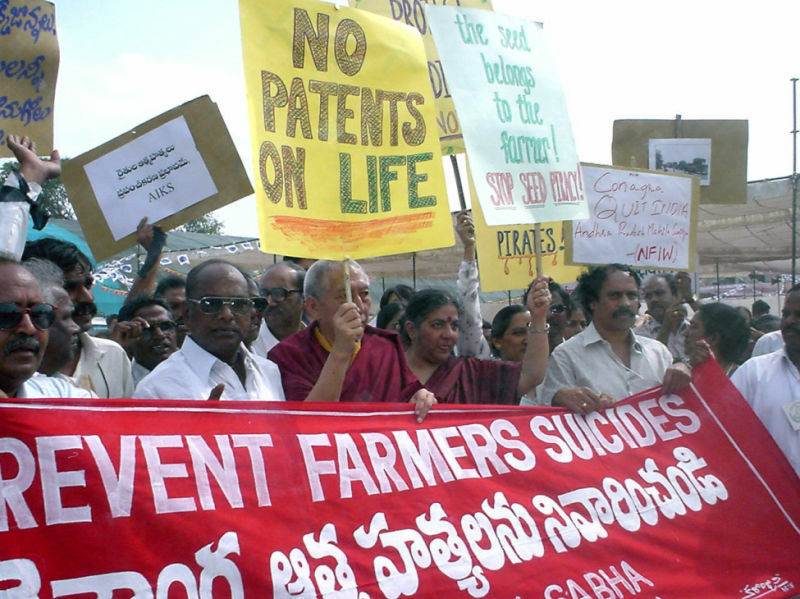 The highest number of farmer suicides were recorded in 2004 when 18,241 of them took their lives. The farmer’s suicide rate in India has ranged between 1.4 and 1.8 per 100,000 total population over a 10-year period, which is very high indeed. According to IndiaSpend India grew more food grains in 2017 than ever before, and the government’s agriculture budget has risen 111% over four years to 2017-18. And yet, prices crashed, unpaid agricultural loans grew by 20%. 600 million farmer families were unable to make ends meet. Oddly enough, the suicide rates were the highest in agriculturally prosperous States like Maharashtra, Gujarat, Punjab, Tamil Nadu, Karnataka, Kerala and Madhya Pradesh. In Madhya Pradesh, 46% of farm households are in deep debt. In 2016, 1,321 farmers had committed suicide in that state. With farming becoming unprofitable, the farmer population came down by over 8.6 million in 10 years up to 2011. With farmers either leaving for the cities or becoming farm laborers, the number of farm laborers increased by more than 37 million. 70% of India’s 90 million agricultural households spend more than they earn on an average each month, pushing them into debt, which is the primary reason for more than 50% of farmer suicides, studies reveal. Agricultural growth and agricultural distress seem to go hand in hand. In Madhya Pradesh, despite a 9.4% growth in the state’s agricultural GDP over 15 years to 2014-15 ( far better than the national average of 3.3% between 2000-01 and 2012-13), the average monthly income of an agricultural household is Rs 6,210, which is less than the national average of Rs 6,426, says the New Delhi based financial daily Mint. This is because farmers are forced by the system to sell their products at throwaway prices. There are Minimum Support Prices (MSPs) but these have not been of much use to farmers. Under the Minimum Support Price (MSP) scheme “Bhavantar Yojna” in Madhya Pradesh, farmers get an MSP only for a part of the produce. The Bhavantar Yojana takes into account the average produce per hectare, which is decided by the Revenue Department. If a farmer grows 12 quintal in a hectare, and the Revenue Department’s average yield estimate is 7 quintal per hectare, the farmer will be eligible only for benefits in line with the government’s average yield estimate. And the Bhavantar Yojna is applicable for only two months during the crop marketing season. Because of this, most of the season’s produce lands up in the market during the two-month window causing a glut in the market and a crash in the prices. And then there the middle man. Traders, transporters and officials collude to keep prices down. Madhya Pradesh has the third largest number of farmers insured under the Prime Minister’s crop insurance scheme and also the Restructured Weather Based Crop Insurance Scheme (RWBCIS) covering 3.5 million farmers. But only 46% of insured farmers in Madhya Pradesh had received their claims. This is so in other states too. There are too many intermediaries in the agriculture-market chain. Over the years, the intermediaries have grown adding little value to the produce but significantly raising the costs. There is also considerable crop loss at all stages and a consequent cost escalation. Fruits and vegetable suffer the most with a loss of 25% to 30% of the production. Disregarding Mahatma Gandhi and C.Rajagopalachari’s ideas, India’s first Prime Minister Jawaharlal Nehru went in for industrialization, neglecting agriculture and the village economy. Later, with liberalization, economic development was given over to private entrepreneurs driven by the profit motive. Given the political clout these elements came to enjoy, all concessions and financial help were directed to them and farmers were neglected. Farmers had to pay more for inputs manufactured by the privatized industrial sector. But the prices at which the farmers were selling their produce kept coming down partly because governments were keen on keeping food prices low to contain civil unrest. The Minimum Support Prices offered by successive governments have never been enough to help farmers get a decent income from which they can save and invest. Since formal credit from banks became difficult because of privatization and the clout of the corporate sharks, farmers had to go to expensive private financiers. Falling into debt became the new normal. And because of the introduction of High Yielding Varieties during the Green Revolution years in the 1960s, farmers were encouraged to use a lot of water and fertilizers which raised the cost of production. In the absence of surface irrigation in many areas, ground water was exploited creating a water scarcity over time. When Rajiv Gandhi became Prime Minister in 1984, he launched a program to encourage food preservation and export. But this required cold storage and preservation facilities on a large scale, which government did not provide. Nor were farmers organized to create such facilities through cooperatives. Successive governments have only been tinkering with farmers’ problem, scratching the surface with schemes brought in as fire fighting measures when farmers agitated violently. India does not lack in good scholarship and agricultural research. But governments have stuck to the beaten track and not taken a bold new path. Meanwhile, the problem is mounting as India becomes a capitalistic economy where the big industrial corporates have the final say in all matters.